In 2010 I met Jana (you might know her from here or here) the second or third time to make pictures with her. There was one picture that came into my head a while ago and I really wanted to let it out. It´s quite goth-ish, I hope you don´t mind. I brought gauze, a red background and a dummy without legs. I wrapped Jana in the gauze until it looked ok for us both. This was - of course - also a lot of fun. We experimented with the perspective for a while, until it was right. After taking pictures of her I photographed the dummy for the lower body part in my picture. The rest was Photoshop. I hope you enjoy the result! Der Rest war Photoshop. Ich hoffe ihr mögt das Ergebnis! I also brought black paint and we made a mess with that to make another picture. But this is going to be another story.. Thank you for reading! | Danke für´s Lesen! Very surreal and interesting work! 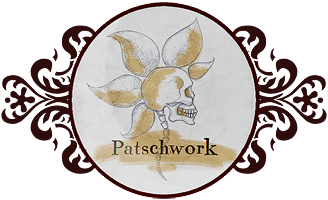 Well done, @patschwork!